A woman who crashed her car into a unlit field in the west of the island was "extremely lucky" to avoid serious injury, her rescuers have said. The Suzuki driver was taken to hospital after her car left the road and rolled into a field narrowly avoiding several trees and a telegraph pole. 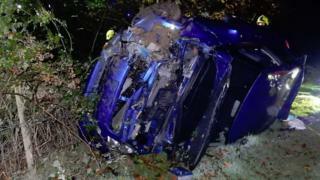 The crashed happened at around 21:00 GMT on the Kirk Michael to Peel Coast Road near Knocksharry Farm on Sunday. Station Officer Colin Kirkham said it could have been a "different outcome." He said: "Once the vehicle left the road it managed to miss a number of large trees as well as a telegraph pole before dropping six feet into the field. "Had the vehicle hit any of these obstacles the outcome may have been so different". He added: "It must have been a frightening experience as she was trapped in a vehicle which was leaking petrol, in a dark unlit field, in a location she was unsure of." Firefighters freed the woman and she was taken to hospital by ambulance.